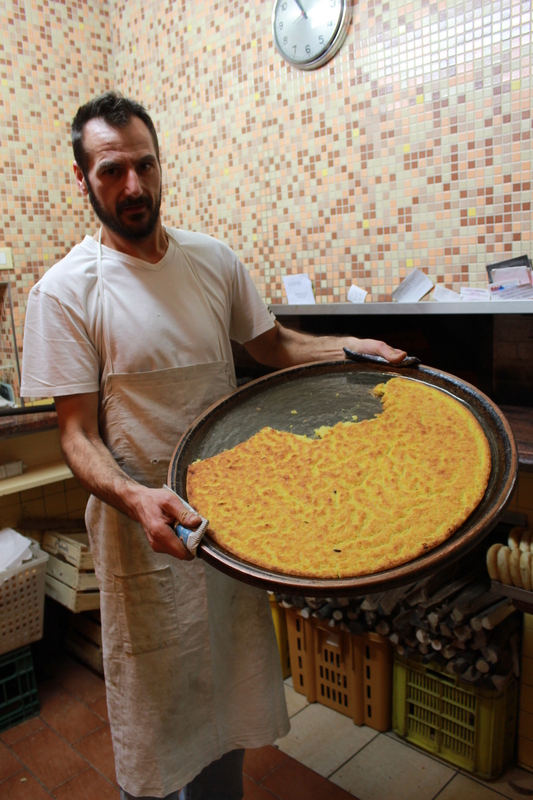 In Livorno you can find torta di ceci as part of a local sandwich, which is popularly called "Cinque e cinque"
Torta di ceci or Cecina is a sort of pancake or flatbread (about 0.5 cm wide) made by mixing chickpea flour with water, salt and olive oil. That's it! It has a round shape and a golden yellow color. 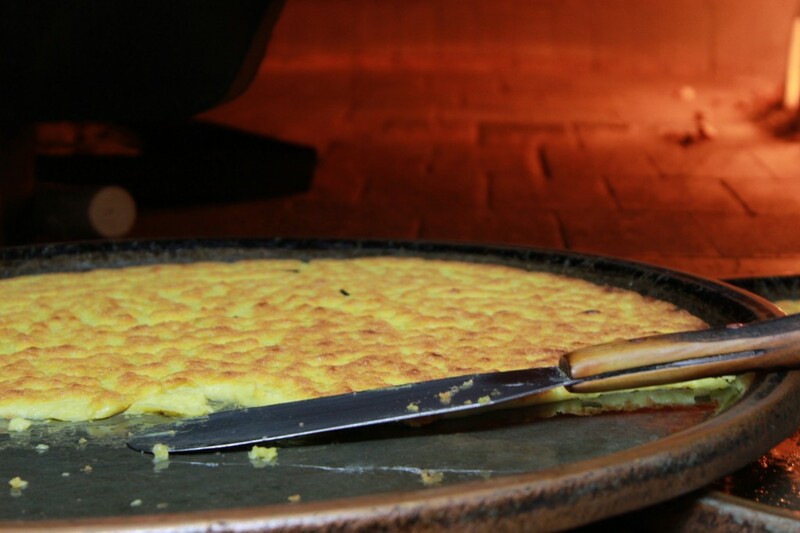 Soft inside and little bit crispy on the outside, it can be found along the upper Tyrrhenian coast with different names: "Cecina" in Versilia and Pisa, "Torta di ceci" in Livorno, "Calda calda" in Carrara, "Farinata" in Liguria, and "Socca" in the south of France. It seems to have arrived in Tuscany through the Lunigiana mountains thanks to trade and by sea via the ships that navigated their way along the Arno from Pisa. The only sure thing is that this "pan di ceci" (chickpea bread) dates to the thirteenth century when chickpeas were one of the few foods that were used for easy storage on board ships. Legend has it that, in 1284, a Genoese ship full of Pisan prisoners encountered a storm and took on a lot of water, which soaked the bags of chickpeas stored in the galley, where there were also several barrels of extra virgin olive oil. For a few days the ship was at the mercy of the waves and the olive oil barrels opened up due to the ship’s movements. No one thought to remove the sacks from the water and, when the good weather returned, the crew found a salty chickpea puree seasoned with olive oil. The Genoese gave that sort of gruel as food to Pisan prisoners. Some sailors refused the dish leaving it in the sun, which made the mixture into a kind of chickpea flatbread. In Livorno you can find torta di ceci as part of a local sandwich, which is popularly called "Cinque e cinque" (five and five), because long ago people used to go to the bakery and buy five Lire of bread and five of Torta di ceci. 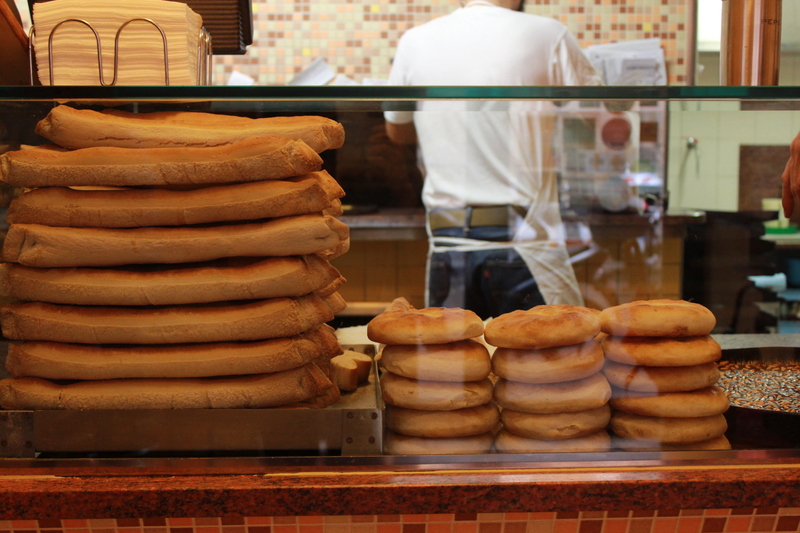 For the "cinque e cinque" a special small long loaf of bread is used, called francesino or a round focaccia. Add a little ground pepper and eat it hot. One of the most famous places in the city to savour "cinque e cinque" is found next to the beautiful Central Market of Livorno. 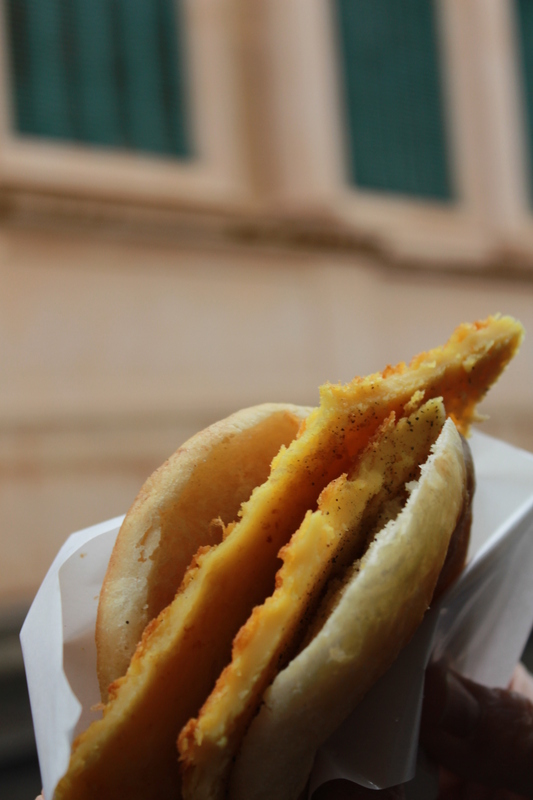 Since lots of people talk about this famous sandwich throughout Tuscany, we had to travel to Livorno especially to try it and, we have to say, the trip was definitely worth it! Special thanks to Claudio Mollo for being our guide in Livorno.